Classified until yesterday, available now: Area-51 cable sleeving! When you think it's a neon yellow, hold something yellow next to it. When you think it's a neon green, hold something green next to it. This is the extraterrestrial color of MDPC-X, codename Area-51. 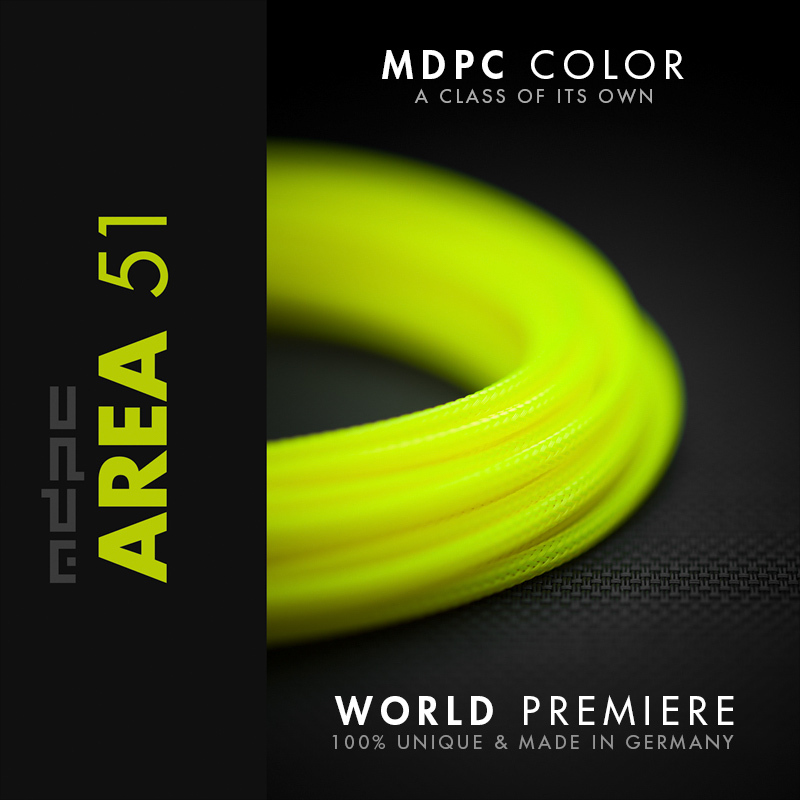 Area-51 is made to be a cable sleeving color, which is out of this world. Fluorescent as extreme as technically possible, this neon color illuminates the near environment under slightest daylight influence. Area-51 casts a subtle glow onto near subjects. Under pure UV-blacklight you will be sure that this one is from outer space. The base material of Area-51 cable sleeving is slightly translucent to achieve these alien effects with a gel like surface. You can push this undefinable color (Neon-Yellow? Neon-Green?) towards one of both spectrums. Put white underneath Area-51 and you have neon-yellow. Put black (see the photos of the MEDIUM sized cable sleeving) underneath Area-51 and you have neon-green. This is experimental, this is MDPC-X Area-51 cable sleeving. 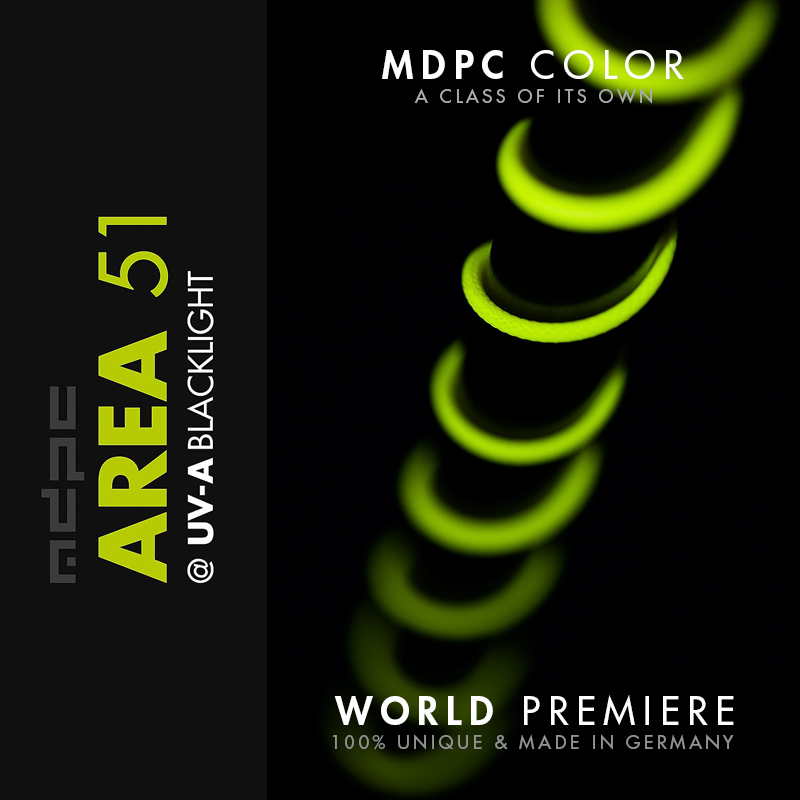 Area-51 is a special demonstration of our class leading German color creation and base material technology. We also added our famous UV stabilizers, so there is no material or color degredation over time, no matter where you use our product. 100% Made in Germany, 100% no compromise, a class of its own. 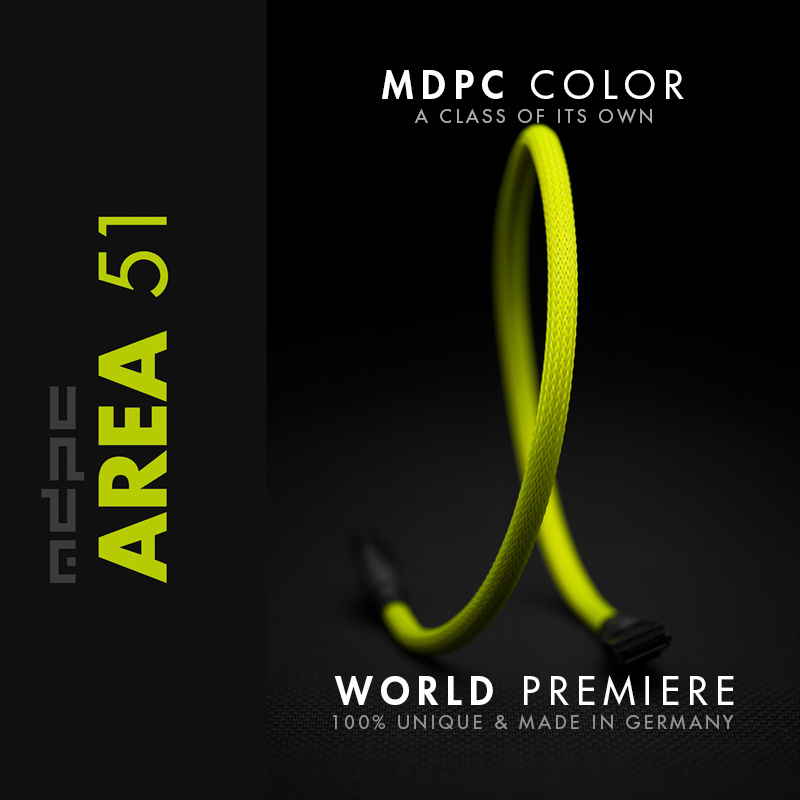 Get the new Area-51 cable sleeving by MDPC-X now! You can order Area-51 directly from us and of course you can also get MDPC-X Cable Sleeving products in even smaller quantities and directly in your continent / country through our global MDPC-X Stores. Area-51 is available as SMALL cable sleeving and as MEDIUM cable sleeves.